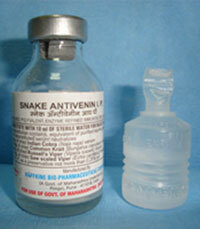 A freeze dried polyvalent snake antivenin useful in case of poisonous snake bites. Lyophillsed form it can be stored at comparatively high room temperature. On reconstitution, it is a solution of purified antibodies prepared from equine blood.Available in vials, along with water for injection, to reconstitute 10ml. 10 ml. 1ml of the reconstituted serum neutralises 0.6 mg of dried Indian Cobra (Naja naja) venom. 0.45 mg of dried Common krait (Bungarus caeruleus) venom. 0.6 mg of dried Russell's Viper (Vipera russell's) venom. 0.45 mg of dried saw scaled viper (Echis carinatus) venom. 1,5,10,20 vials with equal no. sterile water for injection ampoules. Initially 1-2 vials further depending upon degree of envenomation, preferably under the cover of anti histaminics, sensitivity test advised. Occasional sensitivity reactions acute anaphylactic shock which needs immediate treatment. Antihistaminecs and treatment for anaphylactic shock should be kept ready. 4) Saw Scaled Viper (Echis carinatus). Serum Obtained from the plasma contains Purified,enzyme-refined and concentrated specific heterologous immunoglobulins. It is used as a passive immunising agent and affords Protection to the suseptible victims against the bites of the snake species mentioned above.1 ml. of the reconstituted Snake Antivenin neutralises 0.6 mg. of the Indian Cobra Venom,0.45 mg. of common krait Venom, 0.6 mg. of Russell's Viper venom and 0.45 mg. of the saw-scaled viper Venom. 4. Saw-scaled viper, where the patients with clinical signs and symptoms of envenomation. Elicit history of familial allergic disorders such as asthma, eczema, drug allergy from the patient. Whether he had received earlier, injection of serum such as anti-tetanus serum, anti-diptheria serum etc. Carry out the sensitivity test on the patient. Inject subcutaneously 0.1ml of the serum diluted 1:10. Observe the patient for 30 min. for local or general reactions, if any. In the absense of adverse reaction, administer the requisite dose by the chosen route of injection. Keep handy injection Adrenaline (Epinephrine) 1ml of 1:1000 along with antihistamines and steroids to meet any emergency arising out of sensitivity reactions.